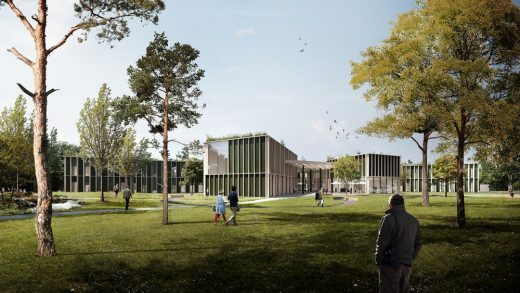 A project designed by a team under the direction of the Brno based young architecture studio CHYBIK+KRISTOF has recently won the international competition for the new administrative centre of the Czech Forestry Commission in Hradec Králové. 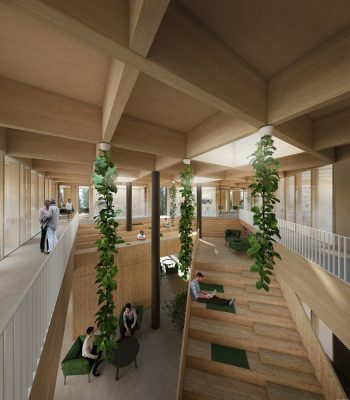 The winning proposal is a two-storey building on the edge of an existing forest, that uses wood extensively as construction material – as requested within the competition. 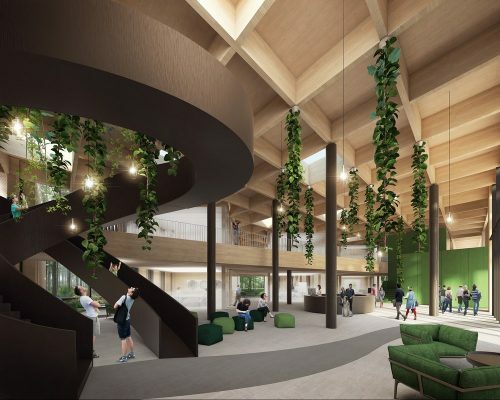 The concept is based on incorporating the forest landscape into a five-finger building to create new relations between the inside office and the outside forest landscape. 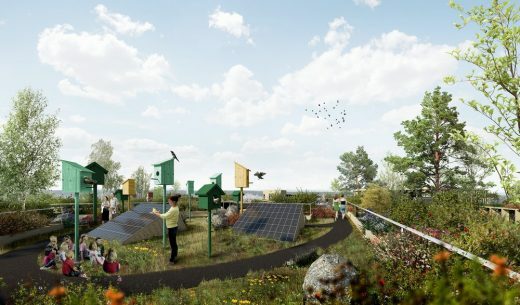 A nature trail surrounding the building allows to explore the different forest ecotypes, designed by Tomas Babka and breathe.earth.collective. 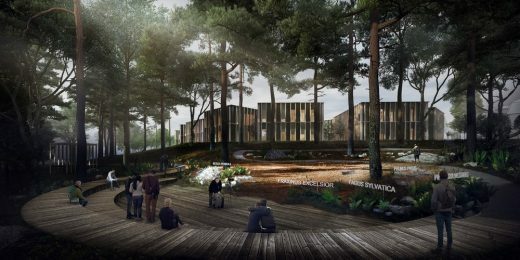 In summer 2016, a public two-round international architecture competition was announced, looking for a design for the new administrative centre of the Czech Forestry Commission that should substitute the existing insufficient headquater buildings on the south-western outskirts of Hradec Králové – a place next to one of the most sought-after forests in the Czech Republic. More than forty architectural firms from the Czech Republic, Spain, Austria, Poland, Slovakia, France, United States, and Netherlands took part in the competition with its international jury consisting of Dorte Mandrup-Poulsen, Dietmar Eberle, Miroslav Šik amongst others. Five of these teams were selected to complete their proposals in the second round. The winning entry presented by CHYBIK+KRISTOF Architects & Urban Designers in collaboration with K4, Ivo Stolek, Jan Stolek, Tomas Babka and the breathe.earth.collective prevailed by its unconventional approach which, according to the jury, makes the building an open public institution rather than an administrative building, fulfilling the vision of a future-oriented envoironment. 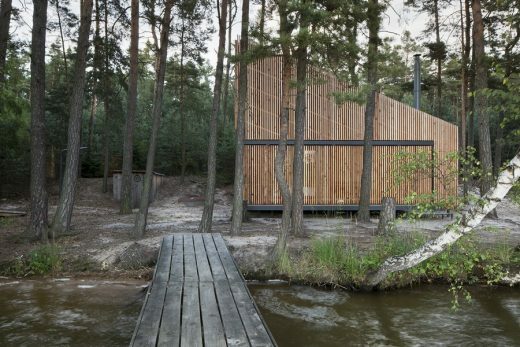 In addition, the jury praised the sensitive way of incorporating the building in the natural surroundings, its open-fronts and the modularity of the construction, which enables a variability of the interior layout. „While inspecting the premises we also took a walk into the wooded areas, asking ourselves what it was that made us work in hot indoor offices when the best thing to do seemed to be to take a laptop to the woods and enjoy the tranquillity and airiness of the place while working. In fact, this idea was the driving force behind our proposal – what we sought to do was create a transparent, yet intimate and highly presentable working space. 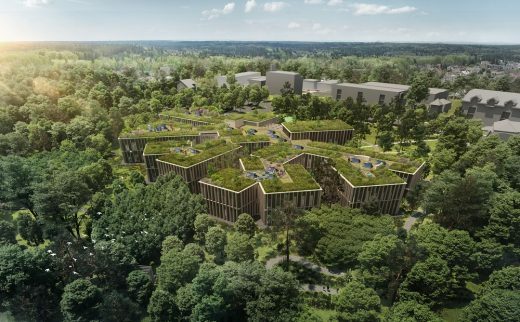 Having this concept in mind, we opted for a radial office layout relying on a central courtyard from which the building penetrates the wooded areas and the wooded areas penetrate the building,“ Ondřej Chybík, a founding partner of CHYBIK+KRISTOF Architects & Urban Designers, says. The office sections are divided into five „fingers“ representing five independent administrative units forming an angle of 45° and converging in the central courtyard towards which the main entrance is orientated. 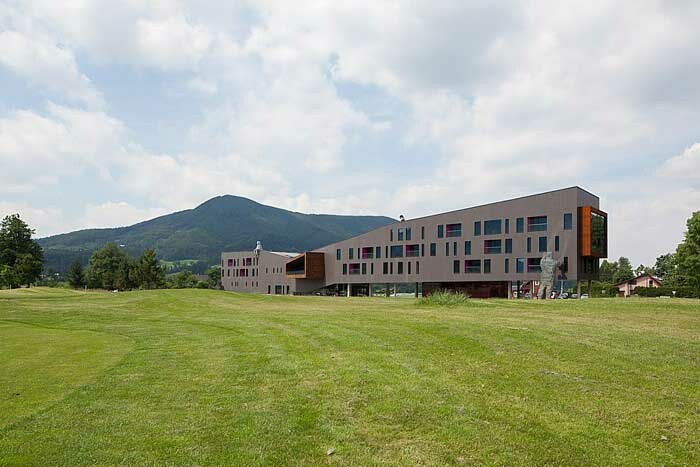 The open front’s defining features comprise two protruding volumes – a conference hall and a cafeteria and canteen – which form the central meeting area of the building. All social functions are concentrated here, like a meeting room and a library. The nature trail on the outside of the building starts on the roof with a presentation delineating the elements of sustainable forestry. The trail continues with a slide that takes visitors down to the courtyard and directs them along a winding pathway around the whole building. 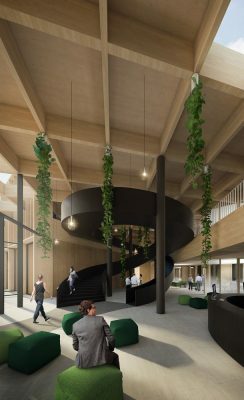 The central two-storey courtyard is lit by roof skylights and is complemented with supporting columns reminding the visitors of tree trunks that give the impression of a clearing in the middle of a forest. The program provided by the visitors’ centre may be seen as an added value of the design of the administrative centre that accentuates its being open to the public. The office areas as such employs the urbanist concept of an office landscape and is interconnected with the exterior.. Corridors are virtually missing in the particular units. Instead, sub-centres with central staircases, storage areas and kitchenettes (which can be used for a number of activities from business meeting to informal gatherings/break-out activities) are inserted. The modularity of the construction enables both the division of the office area into enclosed units and the creation, by removing the non-load-bearing elements, of an open space area with subcentres. The segmentation of the ground plan ensures that all areas can offer sufficient amounts of daylight. The sub-basement is designed to provide additional functions such as parking spaces, wellness and fitness centre, depositories, and places with supplies for the cafeteria/canteen. An integral part of the proposal is the concept of the landscape and vegetation which CHYBIK+KRISTOF Architects & Urban Designers developed in cooperation with landscape architect Tomáš Babka, and the Austrian, breathe.earth.collective, who have been known for their remarkable work on the Austrian Pavilion at the Expo in Milan ‘breathe.austria’. Together they developed the concept to improve the relation between the outside and the inside within an immediate proximity to the building. The five major sectors are going to provide different local forest experiences, such as spruce, beech and fir, pine and birch, and oak and hornbeam forests, which refer to the basic types of forest found in the Czech Republic. 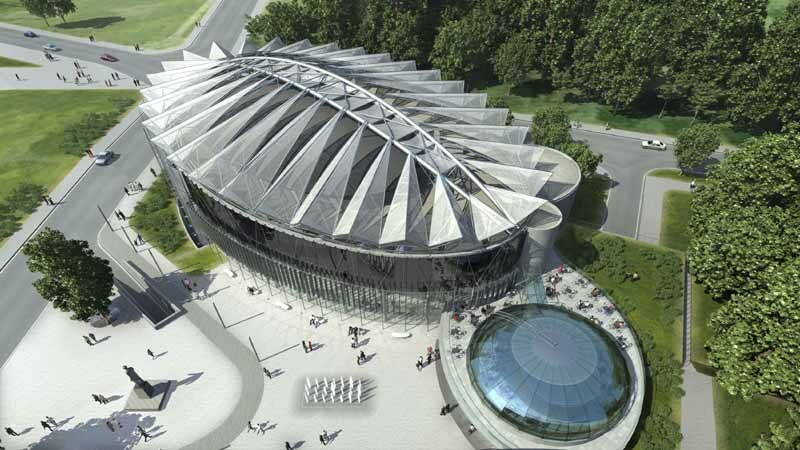 The main entrance is designed to serve as a highly-presentable vision of a park in the future with fully-grown trees performing with technical adeabate cooling elements. The vegetation proposed is not a mere accompaniment to the design. It is rather meant to educate and recharge its visitors as well as the employees through the refreshing forest atmosphere. 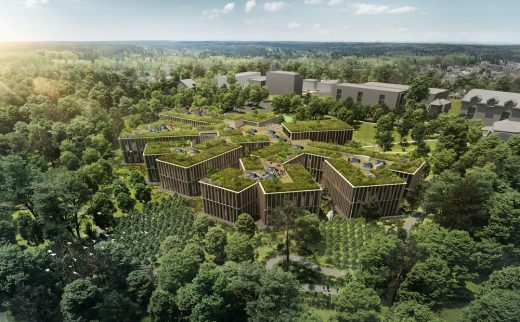 In the open courtyards the succession of the actual forests will be initiated through the provision of an intensive ground layer based on substrates, stones, shrubs and perennials. 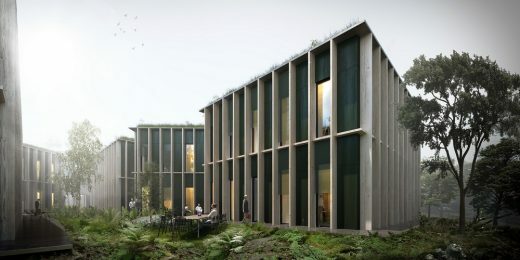 Considering the effort to install an instant forest landscape, the designers propose a development scheme of the forest. The upcoming 20 years the surrounding forest landscape will be constantly changing. 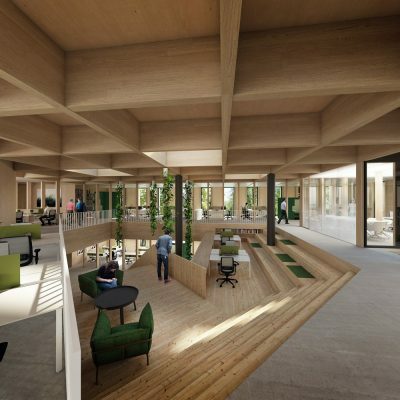 The administrative centre of the Czech Forestry Commission has been designed as an energy-efficient building which makes extensive use of wood as a building and aesthetic material. The above-ground part consists of a framework construction made of glued laminated timber profiles, columns are also made of glulam. 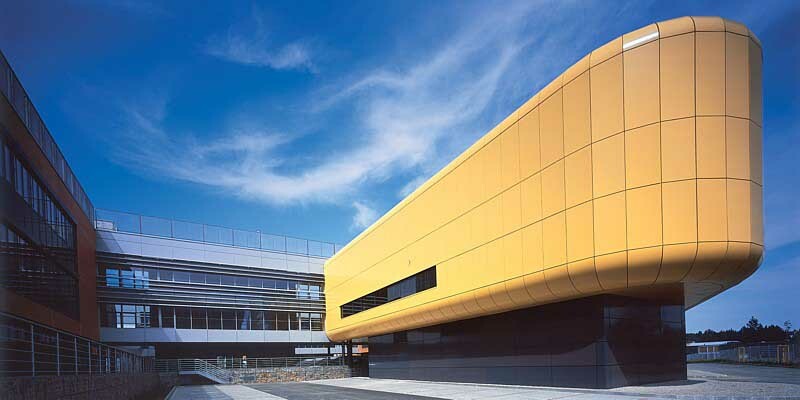 Full facade elements and internal crossbars are made of compact wooden boards. The sub-basement and staircase cores are made of reinforced concrete. Wood pellet stoves are used to provide heating. Alternatively, boreholes can be used and photovoltaic arrays may be installed on the roof of the building and serve as renewable energy sources. In addition, the building is equipped with a controlled heat recovery ventilation system, systems to save drinking water, smart rainwater management systems, external shading devices and energy-efficient LEDs which, as a whole, make it a building with virtually zero energy consumption. Energy consumption and heat and water management data will be monitored closely and accessible to the public on the internet. Design: A PLUS / A.M.O.S. DESIGN s.r.o.